Beef Wellington is definitely a bit on the elegant (stuffy?) side for a Father’s Day patio party, but I was in the mood for some kind of roast and this is about as good as roasts get. Also, I like the challenge, and it is a good opportunity to practice before I try to pull it off for a big Christmas dinner. I really like Gordon Ramsay’s take on the wellington. I like that it is more about the beef and mushrooms, with just a bit of ham and breading for contrast. Since he already went to the trouble, I’ll let him explain the approach and just talk about the sous vide adaptations. Tell ’em Gordon! Maybe a bit less coffee before the next vid there Gordo. There are two main hurtles to pulling this thing off. The first is keeping the beef running with juices without making mush of the pastry (more on that later), the second is getting the cooking time and temperature right so that the pastry hits golden brown just as the beef hits medium rare. Too hot and the pastry starts to burn before the beef warms up. Too cool and the beef cooks to sawdust before the pastry even puffs up. The sous vide approach doesn’t help with the first problem, but it alleviates the second. As I mentioned, I like the focus on the beef, and going sous vide also lets you use the thicker and heartier chateaubriand cut without introducing cooking timing problems. For sous vide beef, I have gotten the best results from a quick light searing (30-45 seconds in HOT oil per side) before the water bath, and another quick light sear after. You can add some ground horseradish, pepper, and/or ground mustard to the bag if you like, but no salt during sous vide! Salt pulls the juice from the meat and dries it out while cooking. This approach seems to retain the most juice and provide the best browned flavor. 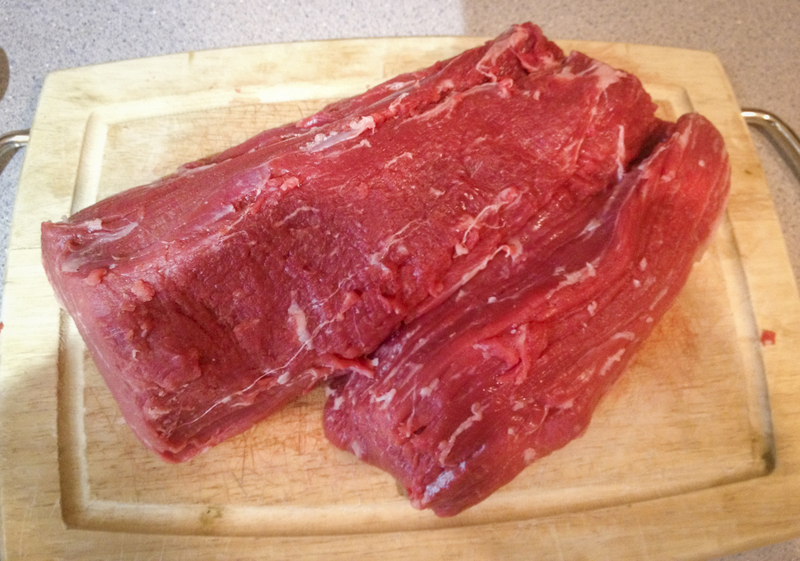 I cooked the chateaubriand at 135 for about 2.5 hours, then proceeded with Gordon’s recipe. When baking time comes, you’ll want to crank the temperature and only bake long enough to brown the pastry. Remember our beef is already warm and fully cooked, so we want as little extra heat getting in there as we can manage. Exactly the right temp will depend on how much you let the beef cool as you are assembling the wellington, but it will probably be in the neighborhood of 425° – 475°. 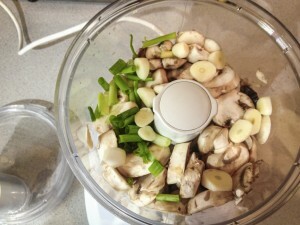 A few thoughts on the duxelles: There are two big reasons this is in there. One, it tastes fantastic. Especially with the beef. Two, it absorbs juices from the beef as it cooks, keeping those juices from making mush of the breading. You’ll find that it takes maybe 15 or 20 minutes of gentle heat and stirring to really dry it out, and it is imperative that you do. Don’t be shy with the salt and thyme, keep throwing them in there until they are just a tiny bit unpleasantly strong in the duxelles, their savor gets distributed a bit and is heavenly in the finished dish. This is father’s day not Christmas, so I skipped the chestnuts, but I used more mushroom to make up for it. Maybe a pound or a pound and a half. Buttons work fine, but some of the more earthy and flavorful mushrooms are worth the extra buck or two. Lastly, the prosciutto (parma ham) is the last barrier for keeping the beef’s juices from ruining the pastry, so don’t leave gaps! This thing was unbelievable. We served it on the back patio with some peasant potatoes, grilled asparagus, and my favorite spicy chianti. It was a huge hit, and I can’t wait for another good opportunity to serve it.